Astronomers using the NASA/ESA Hubble Space Telescope have found a monster lurking in a very unlikely place. 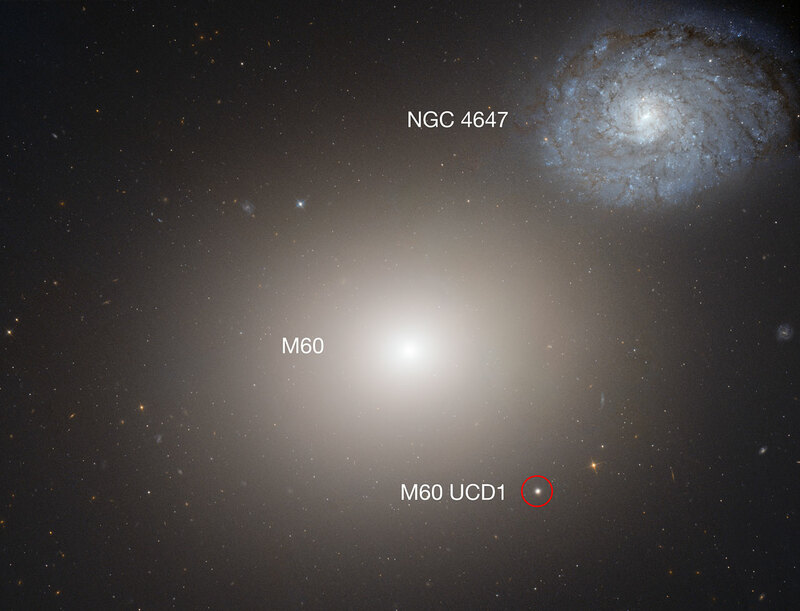 New observations of the ultracompact dwarf galaxy M60-UCD1 have revealed a supermassive black hole at its heart, making this tiny galaxy the smallest ever found to host a supermassive black hole. This suggests that there may be many more supermassive black holes that we have missed, and tells us more about the formation of these incredibly dense galaxies. The results will be published in the journal Nature on 18 September 2014. Lying about 50 million light-years away, M60-UCD1 is a tiny galaxy with a diameter of 300 light-years — just 1/500th of the diameter of the Milky Way. 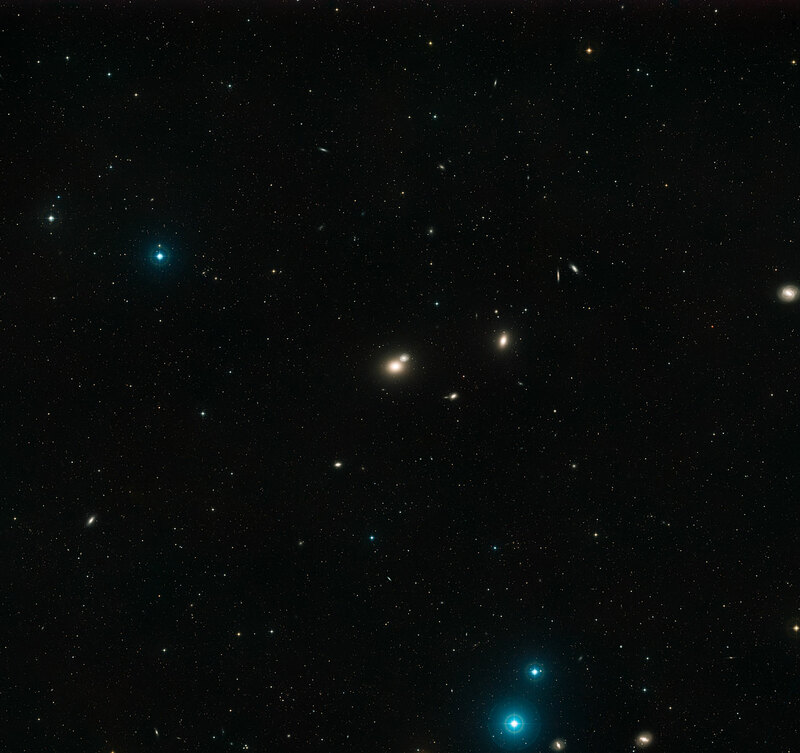 Despite its size it is pretty crowded, containing some 140 million stars. While this is characteristic of an ultracompact dwarf galaxy (UCD) like M60-UCD1, this particular UCD happens to be the densest ever seen . "We've known for some time that many UCDs are a bit overweight. 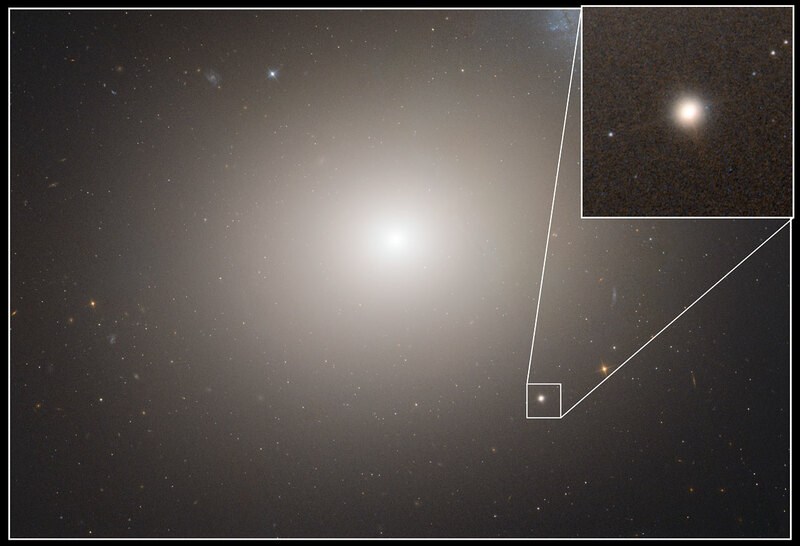 They just appear to be too heavy for the luminosity of their stars," says co-author Steffen Mieske of the European Southern Observatory in Chile. "We had already published a study that suggested this additional weight could come from the presence of supermassive black holes, but it was only a theory. Now, by studying the movement of the stars within M60-UCD1, we have detected the effects of such a black hole at its centre. This is a very exciting result and we want to know how many more UCDs may harbour such extremely massive objects." The supermassive black hole at the centre of M60-UCD1 makes up a huge 15 percent of the galaxy's total mass, and weighs five times that of the black hole at the centre of the Milky Way. "That is pretty amazing, given that the Milky Way is 500 times larger and more than 1000 times heavier than M60-UCD1," explains Anil Seth of the University of Utah, USA, lead author of the international study. "In fact, even though the black hole at the centre of our Milky Way galaxy has the mass of 4 million Suns it is still less than 0.01 percent of the Milky Way's total mass, which makes you realise how significant M60-UCD1's black hole really is." The team discovered the supermassive black hole by observing M60-UCD1 with both the NASA/ESA Hubble Space Telescope and the Gemini North 8-metre optical and infrared telescope on Hawaii's Mauna Kea, USA. The sharp Hubble images provided information about the galaxy's diameter and stellar density, whilst Gemini was used to measure the movement of stars in the galaxy as they were affected by the black hole's gravitational pull. These data were then used to calculate the mass of the unseen black hole. Additionally, the results could affect theories of how such UCDs form. "This finding suggests that dwarf galaxies may actually be the stripped remnants of larger galaxies that were torn apart during collisions with other galaxies, rather than small islands of stars born in isolation," explains Seth. 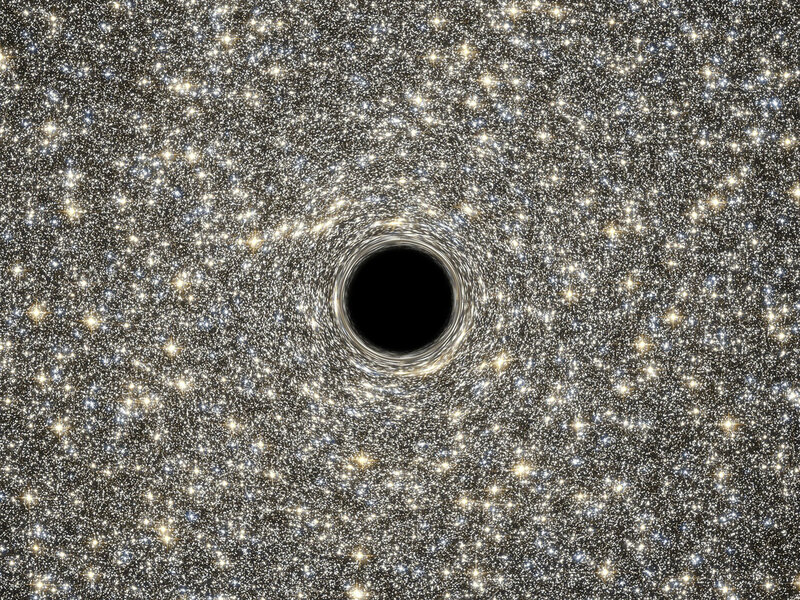 "We don't know of any other way you could make a black hole so big in an object this small." One explanation is that M60-UCD1 was once a large galaxy containing 10 billion stars, and a supermassive black hole to match. 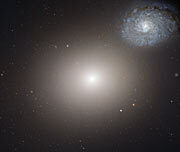 "This galaxy may have passed too close to the centre of its much larger neighbouring galaxy, Messier 60," explains co author Remco van den Bosch of the Max Planck Institute for Astronomy in Heidelberg, Germany. 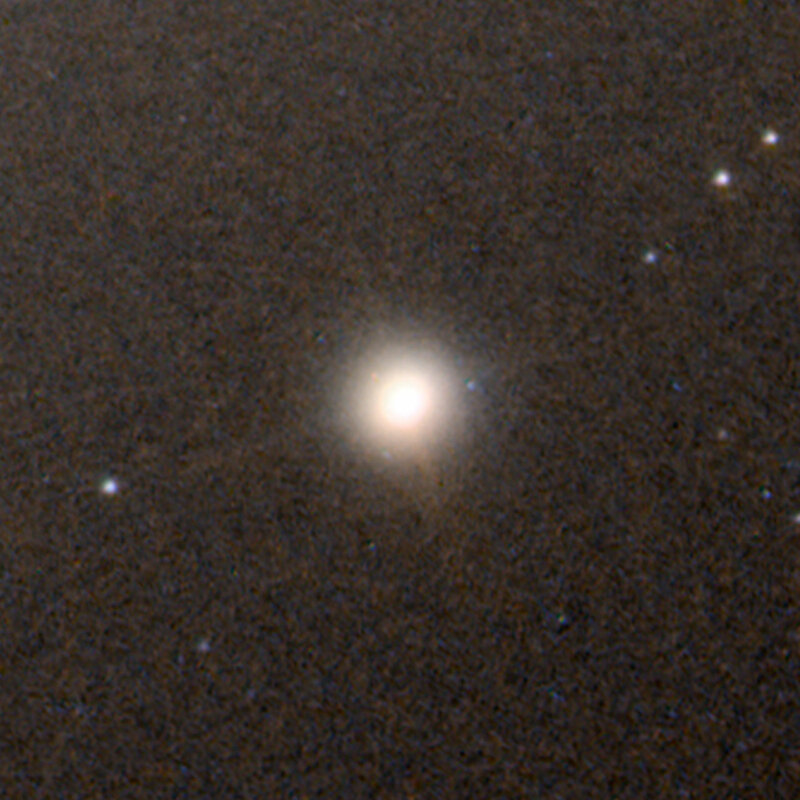 "In that process the outer part of the galaxy would have been torn away to become part of Messier 60, leaving behind only the small and compact galaxy we see today." Black holes are ultracompact objects with a gravitational pull so strong that even light cannot escape. Supermassive black holes — those with the mass of at least 1 million stars like our Sun — are thought to be at the centres of many galaxies. 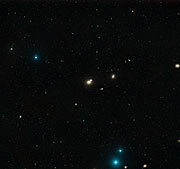 The international team of astronomers in this study consists of A.C. Seth (University of Utah, USA); R. van den Bosch (Max Planck Institute for Astronomy, Heidelberg, Germany); S. Mieske (European Southern Observatory, Chile); H. Baumgardt (University of Queensland, Australia); M. den Brok (University of Utah, USA); J. Strader (Michigan State University, USA); N. Neumayer (European Southern Observatory, Germany); I. Chilingarian (Smithsonian Astrophysical Observatory, USA; Moscow State University, Russia); M. Hilker (European Southern Observatory, Germany); R. McDermid (Australian Astronomical Observatory, Australia; Macquarie University, Australia); L. Spitler (Australian Astronomical Observatory, Australia; Macquarie University, Australia); J. Brodie (University of California, USA); M. J. Frank (Heidelberg University, Germany); J. L. Walsh (The University of Texas at Austin, USA).